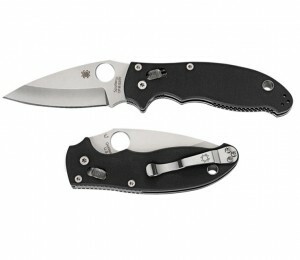 Spyderco's patented Ball Bearing Lock. 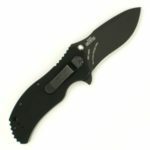 Black G-10 Handle with full-length skeletonized steel liners. 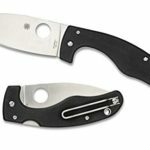 At first glance, Spyderco’s Manix 2 looks like an ordinary folding knife. 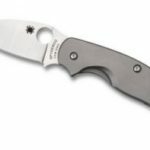 If you look closer you can see that Spyderco has used cutting-edge materials, like their G-10 composite grip, to lighten up the design and pack more performance into the blade itself. 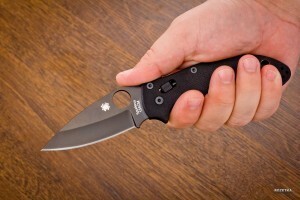 The Manix 2 is Spyderco’s utility knife, and it’s got a little bit of everything. 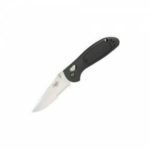 Blending the larger, heavier blade and reinforced grip liner from their ParaMilitary line with a lighter, smoother ball bearing lock, the Manix 2 is an excellent multipurpose folding knife. The G-10 composite grips are slip resistant by themselves, but Spyderco has reinforced that with deep checkering and an ergonomic handle design. 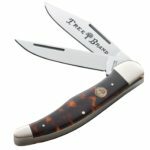 The finger rests are scalloped to provide extra holding power, so this knife is great for anyone who needs performance in slippery conditions. Made with high-carbon steel, Manix 2’s blade holds an edge like nothing else. It sharpens up easily, resists chipping, and can be honed to a razor fine edge in a matter of minutes. The extra weight of carbon steel is balanced by handle inserts, so it maintains it sits well in your hand. 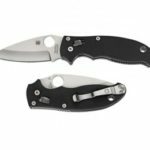 The ball bearing lock, a Spyderco innovation, has a small slide that’s operated with your thumb. 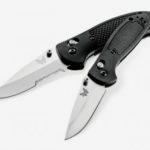 While this works fine if you’re bare handed, other knives like the ParaMilitary G-10 may work slightly better if you find yourself mostly using your knife with gloves on. Part of the tradeoff with carbon steel is maintenance. While it holds an edge far better than stainless, the blade needs to be cared for. It should be wiped dry and oiled regularly in order to keep corrosion and pitting at bay. That may make this knife a poor choice for use around the ocean, since salt water is especially hard on high carbon steels. The Manix 2 really stands out in its role as a premium folding utility knife. It’s just as good at cutting down boxes as it is hacking branches off of firewood. Some knifemakers build a multipurpose knife by stripping away special features and lightening up the handle as much as possible, but Spyderco arrives at the same place through a balance of technology and quality materials. 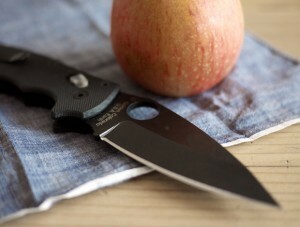 If you’re looking for a knife that does a little bit of everything, the Manix 2 delivers.